Looking for the best hydration to sustain your active and healthy lifestyle? The Bolero Sport is a sports drink that is designed to restore the body’s electrolyte balance, especially after an intense physical workout. It is popular among athletes and sporty individuals who are looking for an alternative to plain regular water. This flavored Isotonic drink is sugar-free and gluten-free and is produced without any artificial coloring, flavoring and preservatives. The Bolero Sport drink is enriched with minerals such as sodium, calcium, magnesium and potassium to help you fight signs of fatigue and maintain normal muscle function. This low-calorie powdered drink is very easy to prepare. Just add it to water and mix to create a refreshing drink. Each serving is packed in an easy to carry sachet that you can conveniently carry around wherever you go. Whether you’re headed to the gym or going out for a run, the Bolero Sport drink can help you stay refreshed and rehydrated all day long, especially after an intense and high-impact workout. Have a question about Bolero Sport? What is it, what does it do, how and when to use or something else? Ask us. 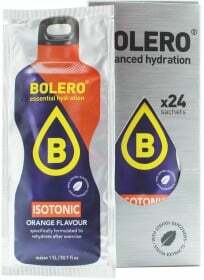 “Bolero Sport 12x9g” is currently out of stock. Enter your details below and we will let you know when it's back in stock. Dissolve contents in 1,5 l / 50.7 fl oz of cold water.